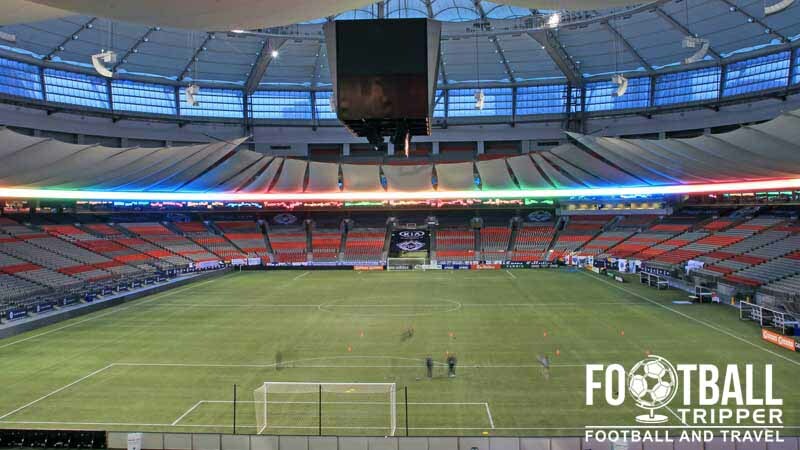 BC Place is a multi-functionally sports stadium located in the city of Vancouver, Canada. The capacity of the ground changes depending on what sport is being played with Soccer matches having a reduce capacity of around 21,000 down from the maximum size of 54,320 spectators. BC Place is a multi-purpose sports venue dating back to 1983 when it was constructed over a two year period in anticipation of the 1986 World’s Fair known as Expo 86. It underwent major renovation in preparation for the 2010 Winter Olympics set to be hosted by Vancouver, with the British Columbia (BC) government announcing that over $150 million dollars was being invested on the 16th May 2008. The substantial renovations were carried out across two phases with the first part of the plan focusing on upgrades to matchday facilities such as the seats, bathrooms, concession areas and corporate hospitality boxes. The second phase involved the removal of the “air-supported roof” and replacement with a cable supported, retractable roof similar to that of the Commerzbank-Arena in Frankfurt. With both roofs being the largest of their kind in the world and the addition of the biggest central-hung scoreboard in North America ahead of the Dallas Cowboys Stadium, it proved to be a monumental task. 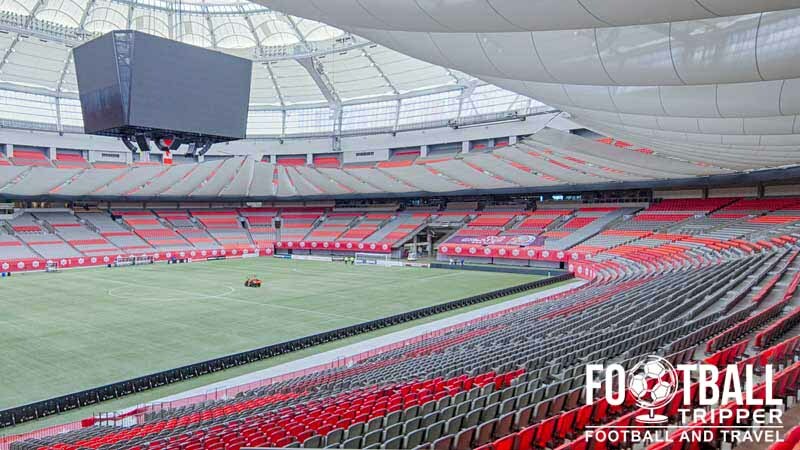 Nevertheless the renovations were finished in time for the Olympics, and many Sports fans consider BC Place to be one of the most beautiful stadiums in the World and Canada’s very own Crown Jewel. British Columbia Place has been home to the Vancouver Whitecaps since the final month of the 2011 MLS season with the club signing a five year lease taking them through to the 2016 season. 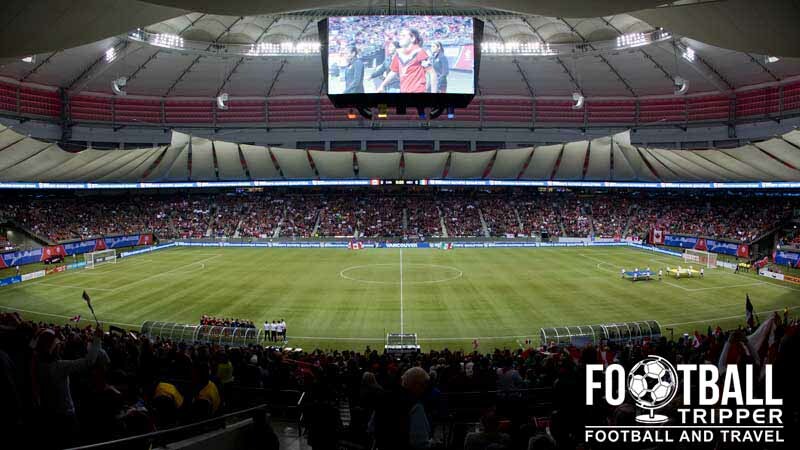 The club’s inaugural match was held against the Portland Timbers, with the 54,320 capacity stadium which is shared with BC Lions Football Team, reduced to 21,000 for Soccer matches. BC Place Stadium is comprised of four stands: North, East, South and West. Located within an urban area there a large number of watering-holes between the Skyline Station and stadium, with discounts available in a lot of places for fans who hold season tickets. Two of the most popular sports bars frequented by fans on matchdays are the Pint Public House & Sports Bar just north of the Skytrain stop, and the Red Car Sports Bar to the west. Inside the stadium Budweiser is available on tap as it is the official beer of Vancouver Whitecaps. Please note that you can’t take your own beers into the stadium, and that alcohol stops being sold around the 70 minute mark of most games. West of the ground on Beatty street there are two popular Italian joints known as Frankie’s Italian Kitchen & Bar, and as you enter the ground Boston Pizza. A few blocks away just past the public library there is the likes of Jimmys Taphouse and Kingston Grille. Inside the concourses of BC Place there are a number of food stalls run by Centerplate caterers which include the likes of hotdogs, burgers and fries using locally sourced ingredients. There are four retail locations situated within Level 2 of the concourse inside the stadium, however as they are inside the stadium they are only open on matchdays. To shop online please visit the official Whitecaps FC Shop. 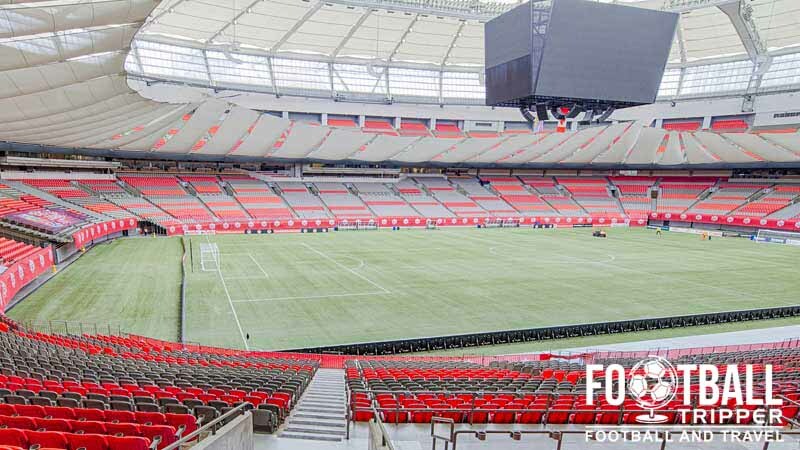 It doesn’t appears as if the operates of BC Place currently offer fans the chance to undertake guided tours of the stadium. For now you will have to make do with this excellent 360 degree virtual tour. Whitecaps fan sporting one of the most Canadian looking hats out there! 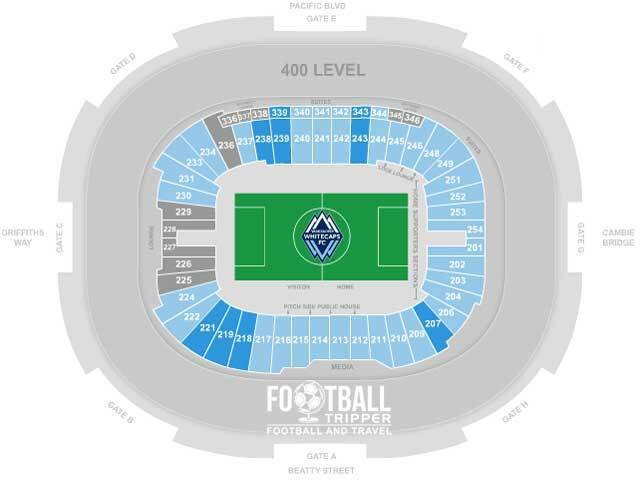 Ticket Prices to see Vancouver Whitecaps play Football during the 2015 MLS season typically range between $30.00 – $150.00 Canadian dollars and can be purchased via the official ticketmaster page. Follow the link to view an interactive map of the ground from which you can select your position within the stadium. The cheapest tickets are generally in the corner and behind the goals. BC Place is located in the heart of downtown Vancouver next to Rogers Arena which is home of the Vancouver Canucks ice hockey team. A look at where BC Place fits in within the overall landscape of Vancouver city central. 777 Pacific Blvd, Vancouver, BC, Canada V6B 4Y8. In addition to two car parks belonging to BC Place there are also up to seven parking areas open to the general public. To see a map of your parking options please click this link. SkyTrain is the name of Greater Vancouver’s rapid transit system, which to me and you means a railroad system. In total the track stretch for a total of 68.7 km ad there are 47 stations scattered across the city. The closest stop is BC Place is the Stadium-Chinatown station located north-east of the ground. This is located on the Expo Line and is identifiable by its dark blue colour on the map. The main entrance to the Stadium-Chinatown station which is the nearest to BC Place. For up to date bus information you are advised to either phone Translink’s Customer Service line on 604.953.3333 or to visit Translink’s website. There are numerous bike lockups dotted around the stadium which encourages fans to ride to BC Place. There is complimentary secure parking by the bike valet at Gate F which might be worth checking out. Within the down town area there are a good number of hotels to choose from with the closest of all being the Georgian Court Hotel followed by the Rosedale on Robson Suite. There is also the affordable YMCA Vancouver and slightly further away is the Moda Hotel.